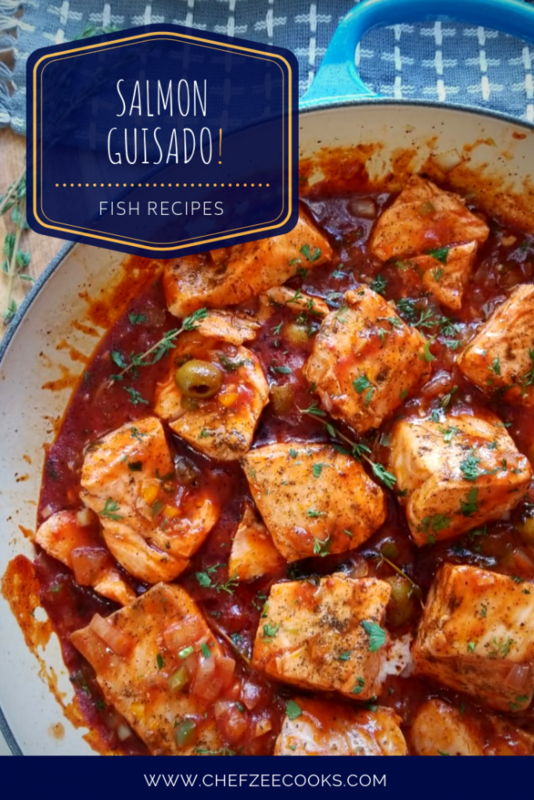 Salmon Guisado is one of those underrated dishes that you easily forget about until you have it and think, “Oh man, I’ve missed you!” This Stewed Salmon dish is perfectly cooked in a flavorful tomato sauce. It pairs perfectly with white rice, tostones, yuca, and much more. Now before we jump into the recipe, I have to confess… It took me FOREVER to master Salmon! For the longest time, Salmon was my Achilles Heel. I seemed to mess it up each and every single time. I avoided cooking Salmon like the plague despite loving just how versatile it is. Salmon— unlike many other fish– is pretty robust. It can stand up to many bold flavors and truly become a treat. However, if you cook it wrong, it can quickly become unappetizing. Let’s face it, we’ve all had Salmon that has that white stuff oozing out. Now listen, that white stuff aka albumin is totally edible. It honestly just looks … eh. The albumin is simply protein from the Salmon that has coagulated. Usually the culprit of this coagulation is heat which is why cooking Salmon at the right temperature is super important. Time out, Zee. What does this mean? This means that you want to be super vigilant whenever you’re making Salmon. You want to make sure that your pan is hot but not too hot. You want to ease the Salmon into the cooking process. If you rush it, then boom– out comes the albumin. Now albumin, is completely normal. And sometimes, no matter how vigilant you are, that white stuff still comes oozing out. Don’t panic– salmon can be stubborn that way. The trick is try to have as little albumin as possible. One way, as mentioned, is by paying close attention to the heat setting and the other is by preparing a brine. If you’re no stranger to my YouTube Channel: Chef Zee Cooks and my blog, then you know I’m a huge fan of brines. I brine more things than even I realize. It’s a great way to infuse flavor and also a great way to ensure that whatever you’re cooking remains juicy. In this case, a brine can also help keep the albumin at bay. Now brines can vary depending on your flavor profile and dish. Just know that the most simple and basic of brines include cold water and salt. This simple brine will do the trick for salmon. Depending on how much salmon you’re making, I recommend placing the Salmon in a large bowl and then covering it completely with cold water. Next feel free to add about 1-2 tbsp of Kosher salt. Let it sit for about 10-20 mins. In the end, rinse the salmon and season as you wish. In today’s recipe, I skipped the brine altogether. To be fair, I brine my salmon according to my mood. Sometimes I do the extra step while I prep the other ingredients. If I’m in a rush … you guessed it, I skip the brine. Today’s recipe is also pretty special to me. It’s a Chef Zee classic. Meaning, what exactly? It means that this is a recipe that I developed on my own vs. channel my grandmother as I do with most of my recipes. Growing up, I didn’t really eat lots of fish outside of shrimp and cod fish. Very few people in my family ate fish and when we did, my grandmother kept it pretty simple and familiar. If we did have fish, then it was probably Lent Season. However, as I grew older and began cooking on my own, I started to experiment. This is how I learned that Salmon and I were not friends– at home! It was usually a fish that I ordered in restaurants because I couldn’t seem to get it right. Fast forward to many failed dinners and I’m proud to say, that Salmon has defeated me no more! More importantly, I began making salmon at home because I wanted to make sure that it was being sourced responsibly. I’m a stickler for fresh Wild Caught Salmon. The color and flavor is undeniable! Definitely be on the lookout for Fresh Wild Caught Salmon the next time you’re shopping! Once you’ve removed the salmon, add onions, bell peppers, garlic, pinch of salt and pepper. Saute for 2 minutes until veggies have softened and become translucent. Next, add in the rest of the orégano, tomato paste, tomato sauce, and ¼ cup of water. Mix everything together until it’s well combined. 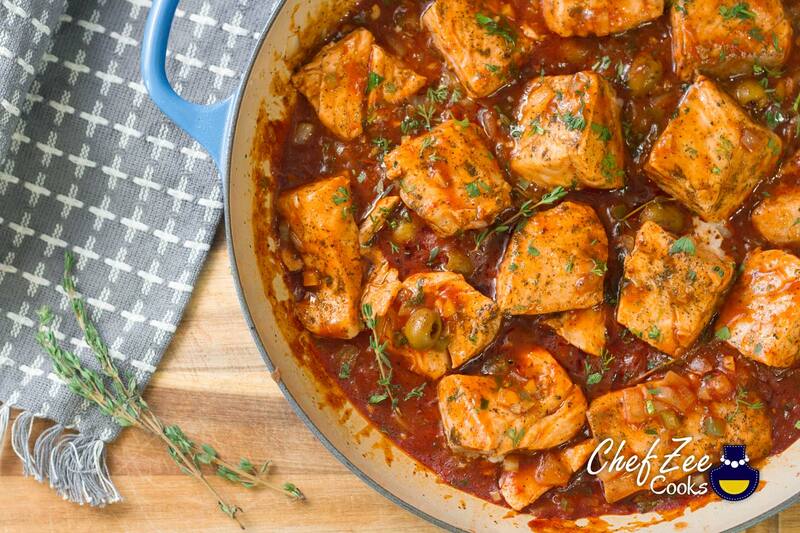 Once the sauce begins to simmer, add in ¼ dry white wine or your favorite cooking wine. Then add fresh cilantro and wine. Let sauce simmer for an additional 2 minutes. Taste sauce and adjust seasoning for salt and pepper. Afterwards, carefully add in salmon and flip each piece over so that each piece is covered in sauce.